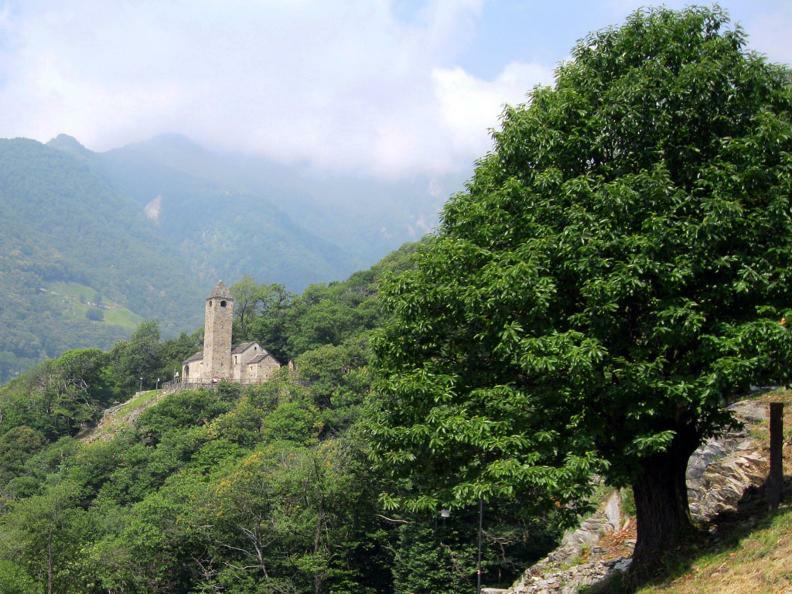 Like many other villages situated to the right of the plain of Magadino, Monte Carasso is made up of different settlements - one on the floor of the valley, one at the foot of the mountain and one further up the mountainside. The original lower settlements were on important transport routes, whereas the ones further up were developed to make the most of the agricultural land available. The land around these villages was used for vegetable plots, pasture, the cultivation of cereals and vineyards. This itinerary offers an opportunity to explore one of these mountain communities as well as the church of San Bernardo with its fascinating frescoes; not many people outside the area of Bellinzona are familiar with them. It's possible to travel up the mountainside by cable car or by foot; either way the trip starts from the departure station of the cable car in Monte Carasso. Half way up to Mornera is an intermediary stop - Curzutt (Variante A), from here a few minutes walk along a signed path will bring you to San Bernardo. If you decide not to go by cable car, you drive as far as the Lori aqueduct, then walk up to San Bernardo following the path that winds through chestnut woods (about 15 minutes). 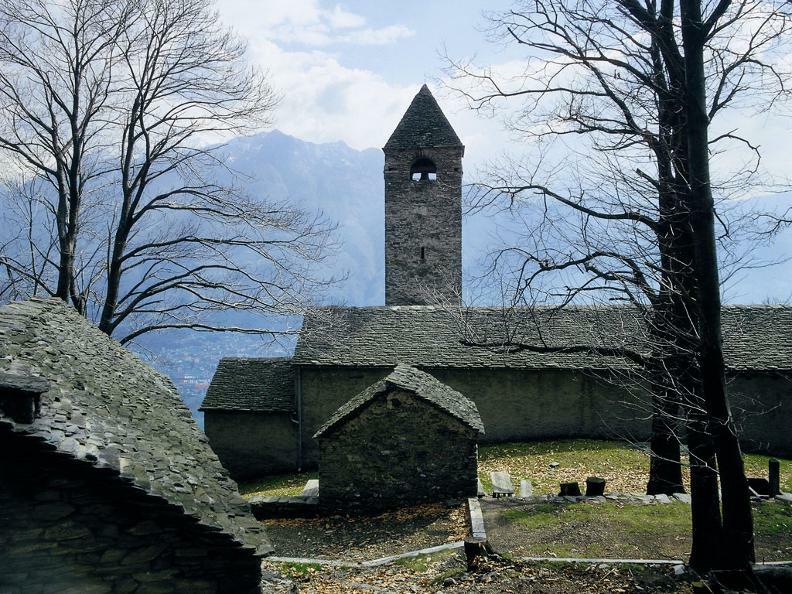 After a visit to the church take time to enjoy the panorama, which opens up over the whole region of Bellinzona before heading back to Curzutt through chestnut trees and dry stone walls. Curzutt means Lower Court and is the only settlement which has survived; today it is at the heart of an interesting project aimed at rescuing the surrounding environment, the landscape and history of the area by the «Curzutt - San Bernardo Foundation». Several families lived here up until the 18thC and despite the scarcity of water they managed to make a living cultivating the land. As well as reclaiming the woods and the pastures, several rustic cottages have been earmarked for restoration bringing life to a youth hostel with conference rooms as a youth hostel. A vineyard has also been replanted using biocultivation methods. 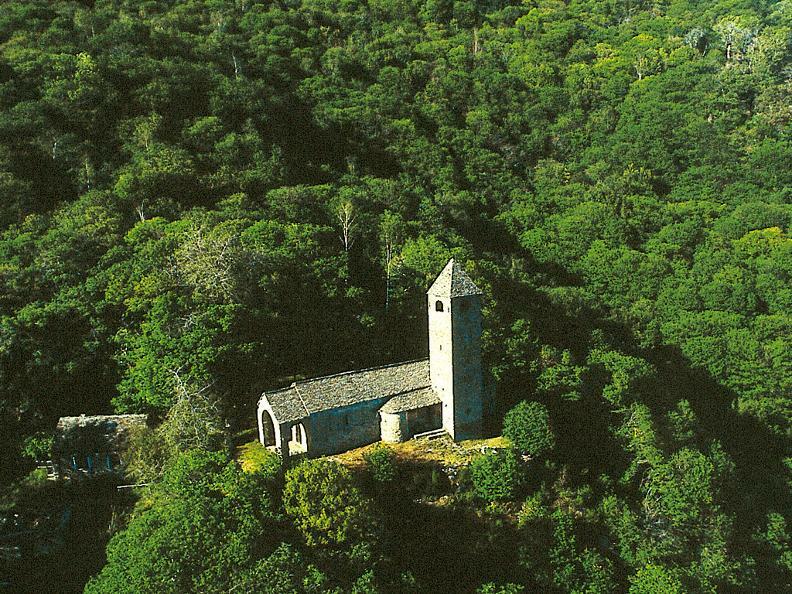 The church of San Bernardo stands in a clearing in the woods above Monte Carasso at about 600m above sea level. Set in splendid isolation today, at one time it used to be an important part of village life, despite the fact that the village «centres» were spread over a wide area (one part of the village community is half way up the mountainside). Up until 18thC these separate village 'centres', including Curzutt, were inhabited all year round by groups of families. This explains the presence of a full size church, (not merely a chapel or little oratory) so far from the level plain. Following archaeological research carried out in 1972 it was established that the origins of San Bernardo go back to the end of 11thC or the beginning of the 12thC. This Romanesque church was built at the same time as the church of Saints Bernardino and Gerolamo on the plain, with similar dimensions and capacity. This means it was not a secondary church built for the convenience of a few families during the summer months, (as it was often the case in the mountains) but intended to serve the community in permanent residence. The original building had a rectangular ground plan with a semi-circular apse. It was decorated towards the end of 14thC with frescoes of the Madonna Enthroned; in 1427 the north wall was decorated with both religious and secular paintings by an unknown artist. During the second half of the 15thC the nave was extended with a porch and the bell tower was probably added at the same time. Another painting campaign resulted in frescoes on the new walls and restoration of the existing frescoes were also done: this task was assigned to the work shop of Crisotoforo and Nicolao da Seregno in Lugano who covered much of Ticino between 1480 and 1490. Several changes took place during the following century: a chapel was opened up to the south; the porch was frescoed and during the last years of the century the old apse was demolished and a new one was built but only decorated some years later. From 17thC onwards there were no major structural changes made, almost as though the church had already lost some of its importance. The most recent pictorial restoration was carried out in 1972/4. The porch still has paintings from 1582 (the Ascension of God the Father with Saints Magdalena and Bernardino to the right, and to the left, the patron saint - Bernardo and either San Maurizio or San Vittore). These have been marked with graffiti by passing pilgrims. On the south wall is a large St Christopher from the end of 14thC. Behind the church is an ossuary chapel. The architectural sobriety of the interior is in marked contrast with the richly frescoed walls. On the opposite façade is a portrait of Christ in the sepulchre between two angels and several saints. To the left of the entrance are several elegant works - Mamete, and Margherita crushing the dragon, and Guido holding a date palm; to the right St. Sebastiano (with sword and arrows), Nazario and Celso. The cornices are typical of the work of the Seregnese workshop (15thC); they are probably votive paintings. A large Last Supper takes up most of the north wall. Together with the two saints to the left (Teodolo and Bernardino) it has been attributed to Cristoforo da Seregno (1450). One can observe the artist's attention to local detail (freshwater crabs, cherries). The cornice unites The Adoration of the Magi, several saints (Anna, Michele, Maurizio, Maddalena and Caterina) and the Crucifixion. Below is an interesting series dedicated to the Months of the Year, dated 1427. A few years later a saintly bishop was added to the right; this may be Eusebio. In 1607 the choir was frescoed with a Large Crucifixion, scenes from the life of San Bernardo, the Annunciation (over the arch), the Evangelists and doctors of the church (in the ribbing of the vault). Continuing along the south wall one can see several saints, and a portrayal of the tragic martyrdom of Santa Apollonia (painted around 1480 and attributed to Nicolao da Seregno) as well as a 14thC Madonna with Infant. In the side chapel is a scene from the life of San Nicolao together with other Saints (1565). The Trinity portrayed among the Saints Agata and Lorenzo (to the left), Martino and John the Baptist (to the right) is very interesting and probably attributable to Cristoforo da Seregno. 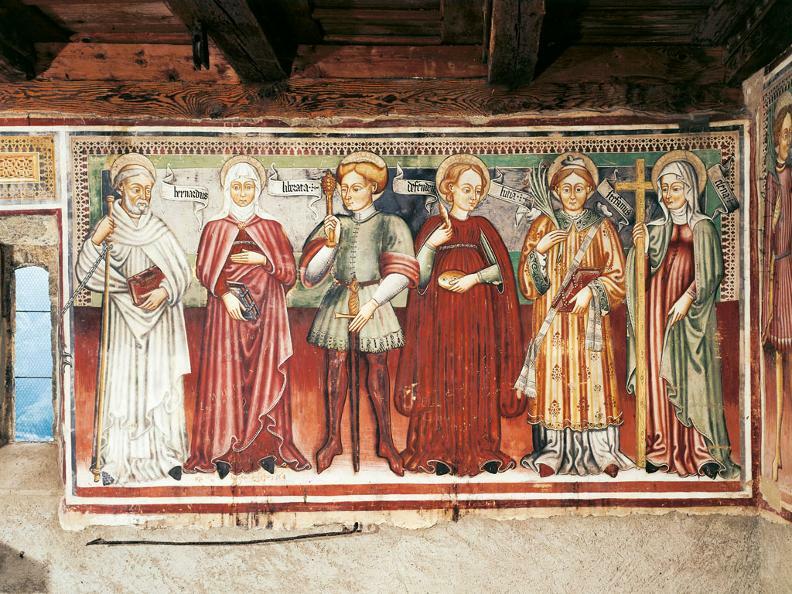 They are followed by San Bernardo (with an enchained devil), Santa Liberata, patron saint of women in labour, Defendente, Lucia, Stefano and Elena (votive frescoes from the workshop of the Seregno brothers). Key: from the hostel in Curzùtt. Centre of Monte Carasso: subject of a rural reclaim project, it won the «Wakker 1993» (sponsored by the Swiss league for National Heritage protection) and «The Prince of Wales» award in 1993 from Harvard University, Boston, USA. Antique Augustine convent:15th/16thC building restored in 1990-93 to a plan designed by the arch. L. Snozzi. The convent regained its original appearance with the interior courtyard and the arches. Today it is the elementary school and cultural centre. Church of SS. Bernardino and Girolamo: Rebuilt in 15thC on the site of a pre-existant Romanesque oratory and enlarged over the following centuries. 16thC frescoes on the façade, S. Christopher, the Annunciation and Veronica under the portico. Church of the Holy Trinity: Situated above the village on a rocky spur. By cable car from Monte Carasso to Curzutt.